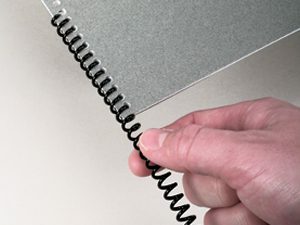 There are many methods of binding documents, and choosing the right type for your unique printing project can be tricky. That’s why here at 3rd Coast Imaging we put together this quick guide on binding documents. Case binding is the most common type of binding for hardcover books. The pages of the book are arranged into sections, sewn together, and the outside covers are attached. This is a very secure, and final way to bind a hardcover book. It looks professional, and due to its common use it is what many people expect when handed a hardcover book. Coil binding is another highly secure form of binding that prevents documents from being added or removed by crimping the wire at the end. Just as with wire binding, documents will open a full 360° for easy note taking and photocopying. Comb binding uses a single plastic comb to hold pages together. It is one of the most economical options to bind documents, and allows for simple edits with a quick edit tool. Comb binding also allows a document to lie flat for photocopies and note taking. Comb binding is often referred to as GBC binding. Perfect binding is often thought of as paperback book binding. 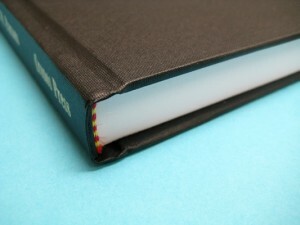 It relies on flexible adhesive to attach the book cover to the spine of a document. It is a simple and cost effective way to bind reports, brochures, etc. Screw post binding uses screws to bind a document. This method allows for very simple editing of the overall document via removing the screws and adding or subtracting pages. It also provides a less utilized look that can really show off a document’s ingenuity and professionalism. Screw post binding is the most effective for extremely large documents. Saddle Stitch binding is essentially binding a document via staples at the spine. Saddle Stitch binding is an inexpensive, yet professional looking way to bind a document on a budget. Wire binding is often used for presentations and other internal documents. It is a very secure, elegant looking way to bind your document. Wire Binding allows the document to open to a full 360° rotation for convenient note taking and photocopying and lets pages lie flat. Whatever your print and binding needs are we have a solution for you here at 3rd Coast Imaging. Contact us to learn more!